52-page giant. Cover pencils by Curt Swan, inks by Murphy Anderson. 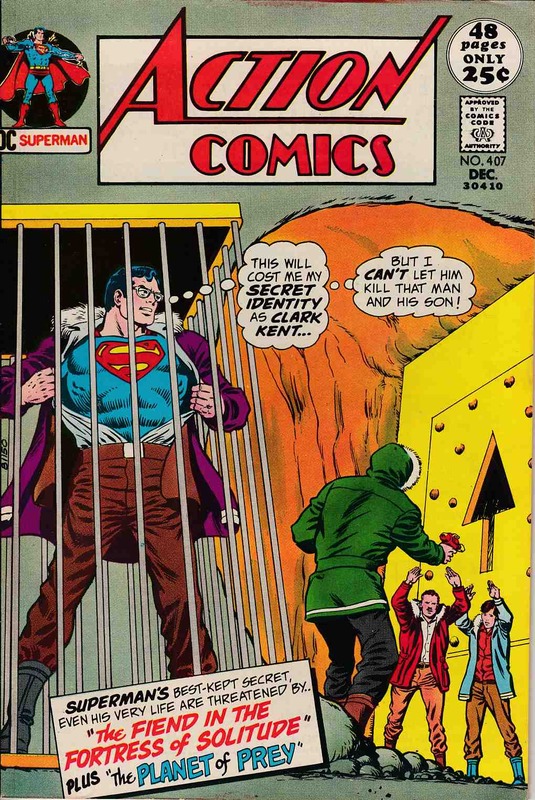 "The Fiend in the Fortress of Solitude," script by Cary Bates, pencils by Curt Swan, inks by Murphy Anderson; A gangster discovers the secret location of the Fortress of Solitude, enlists his son and a specialist (who turns out to be Lex Luthor) to help him get in, and, for a hostage, takes Clark Kent along. Classic reprint, "The Challenge of the Expanding World" (Part 2), script by Bob Haney, art by Alex Toth; The Flash and The Atom team up. "The Planet of Prey! ", script by Cary Bates, pencils by Curt Swan, inks by Murphy Anderson; In outer space, Superman encounters a planet that tries to eat him.